While practitioners may be familiar with the basic concepts related to tax exempt organizations, many fail to understand the various exceptions and special rules that apply to ministers. 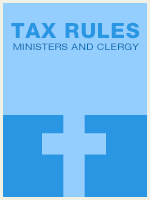 Although tax exemption only applies to organizations, a host of special rules, including certain exemptions from gross income, apply to the individuals that perform ministerial services for churches and religious orders. The issues can be tricky to spot, and a lack of knowledge about the special tax treatment afforded to ministers can result in an over- or under-payment of tax. This course is designed to remedy any weaknesses the practitioner may have in his or her understanding of the tax rules applicable to ministers. The relevant definitions are explored, as well as the major issues of withholding, self-employment tax, and the parsonage allowance are covered, including other common income and expense issues.